If you think your partner would love the idea of being involved in designing their own engagement ring, but you don’t want to pop the question empty handed, The Promised Ring might be just what you’re looking for. 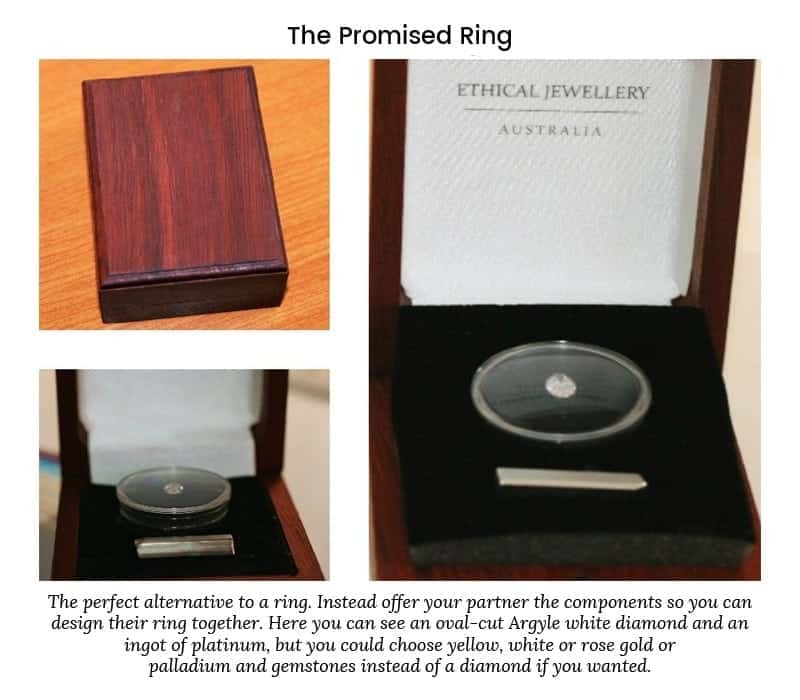 Instead of buying a ring, buy the metal and the diamonds or gemstones and present those in a beautiful wooden box. Of course, you’ll still need to make some decisions. For example, which precious metal (white, yellow or rose gold, platinum or palladium). And what combination of diamonds and/or gemstones to include. We’ll be happy to help you with this if needs be. Quite often Promised Ring buyers choose just the metal and the feature stone (diamond or coloured gemstone). If your partner’s preferred design calls for it, accent diamonds or gemstones can easily be added later. Melinda, my fiancee, loves the ring, and loves the story behind it. We are both very excited! Thank you for your part in creating a unique, better than standard eco-friendly ring that we will both enjoy for many years to come! I will certainly be recommending your “promised ring” sets to my friends as well. I think they’re a great idea! The Promised Ring solution isn’t for everyone. Many of our customers love rolling up their sleeves and getting involved in the design process right from the get-go. That said, there are also plenty who know their limitations and opt for The Promised Ring. There are a lot of decisions to be made when designing a ring for someone else and it can be a daunting task. There are so many settings and styles — art deco, modern, antique, bezel, claw, illusion, tension, pave, two tone, channel setting, classic Tiffany and so on. And then there are things like the options of filigree work, milgrain etching, engraving, shoulder stones, high set or low set. Would your partner prefer a central diamond or a coloured gemstone like a sapphire or ruby? And what about a matching wedding ring? And, what size finger do they have? The beauty of The Promised Ring idea is that it allows you to make a thoughtful purchase and gift of the key ingredients. And your partner gets to be fully involved in the design process. As a registered Gemmologist, Melinda must adhere to a strict code of ethics; the qualification is hard won and she takes it very seriously. 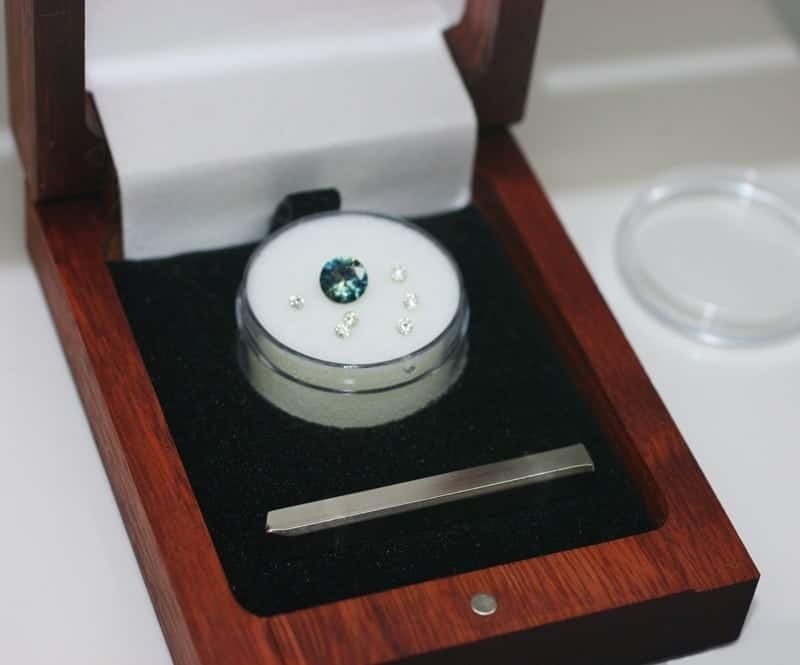 As a result, we only offer GIA (or other relevant certified) graded material and that means you will receive exactly the colour and clarity that you have paid for. The metals we supply are pure and responsibly recycled and our traceable diamonds are non-conflict, untreated and cut by a workforce free from exploitation. By the way, the recycled metals we supply are exactly the same quality as newly-mined metals. By choosing loose stones and metals this way and having them handmade into a ring, you will ensure that the finished piece is going to last the distance. The only way to create the ‘best’ is to start with quality, pay attention to design and have it made by a top craftsperson. The end result will be a piece of jewellery that is durable, beautiful and values higher than what you paid for the component parts. How will I know what to choose? All you need to do is give us an idea of your budget and tell us a few things about your partner and the rest is easy. Once we know a bit about their personal style, their colour preferences and their lifestyle, occupation and interests, we’ll be able to safely guide you the rest of the way. First instinct often tells us that ‘the bigger the better’. Perhaps your heart is set on purchasing a one carat diamond, but your budget isn’t quite up to it? Many people in this situation choose to buy several stones that add up to a carat – or purchase synthetics (a great ethical alternative). Experienced jewellers will also tell you that buying the best you can afford is the way to go. 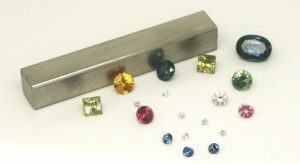 So you might be better off choosing smaller, higher quality stones that really will dazzle. You might also choose to ditch the diamond altogether and choose your partner’s favourite gem or birthstone instead. Then perhaps sprinkle a few accent diamonds around to add a bit of sparkle. Striking central coloured gemstones are very popular and could be a wonderful way to create the ‘Wow-factor’ without breaking the bank. When you are choosing something this significant without your partner’s input, it’s important that you are able to show them that you put a lot of thought into their feelings and preferences when making your decision. The beauty of The Promised Ring is that you can still offer the element of surprise and ensure your partner ends up with exactly what they want. If The Promised Ring sounds like the perfect solution for you, get in touch via our contact page or call us today on 07 3379 2596 to have a friendly chat about your options.